Burl, burr or bur wood is obtained from tree that had abnormalities in infancy. Burl could be the result of stress on the trees, infection from the insects, virus, or fungal attack. Burl wood is appears as a bunch of bulge and the knots at the tree trunk or branch. After the wood is cut, then the burl is utilized as a special wood part and has high value because of its unique appearance. 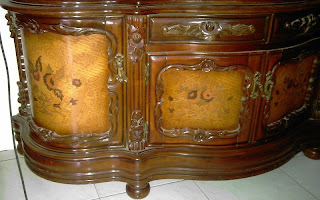 By the artists, burl is used to make the wooden sculptures with special form. 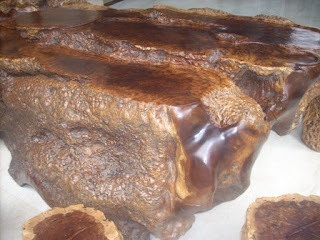 By the carpenter, artist or furniture maker, the burl is utilized to make some special furniture. In the woodworking industry more burl wood are slashed and cut to make veneer. Burl veneer for some wood such as: oak, walnut, maple, etc. can be purchased with the high availability. Thus, the beauty and uniqueness of the appearance of burl wood can be obtained with relatively inexpensive price. The burl veneer is fully with knots with swirl around. As a natural product, the patterns of burl are usually varied and have irregular form. The burl veneer with “relative uniform “pattern can be ordered and with higher prices. The burl veneer is widespread and found in many products wood product such as: furniture, walls, doors or other wood products. But as special veneer the burl need to be handled properly. Despite of his special looked; the veneer has some special properties that make it is needed to be taken care in special way. Here are some important things to be considered when we dealing with burl veneer. The veneer has a lot of knots, so it is structurally fragile and brittle. The veneer also tends to contract or expand with high coefficient. The result is the veneer is easy to get crack and splitting problem. To minimize the veneer problem then we need to soften the veneer before at the gluing process. Apply the veneer softener to the veneer before we laminated the veneer. The gluing can be done with the hot press or cold press, but make sure that the proper glue is used. Burl is naturally is brittle and rupture. It may be not as brittle as the crotch but it still has high risk to get crack problem. To minimize the crack problem then the glue sizing process is recommended. We can put a thin of glue at the veneer surface after the veneer lamination, before the sanding process. The glue will cover the pores and grain to reduce the water absorption and make the veneer is more stable. The veneer figure is the main factor to build the special looked for the burl. But the fact is the veneer could have the variation at the patterns of dots and swirl and the color base. If the variation is quite big, then it could be make the product is looked “strange”. To get the maximum beauty, the veneer need to be properly set and matched. Make sure we match the veneer selection before the laminating process to get the well looked panel. Finishing for the burl veneer. The burl veneer is a premium veneer with high price. We need the proper finish to get the maximum benefit of this product. The proper finishing works to stabilize the veneer. The coating layer will cover the pores and grain to reduce the porosity of the veneer and lower the risk of veneer crack and rupture. But the finishing should more concern to the looked of the veneer. We need the proper finish to enhance and maximize the veneer beauty. The transparent color is recommended for this veneer. The thin stain that is directly applied at the wood will bring the beauty of the wood veneer. The glaze application is also can be used to enrich the veneer looked. We can do highlight for the stain and glaze to enlighten the wood veneer pattern. The too thick stain should be avoided since it may block the veneer pattern and kill the veneer beauty. The paint finish is not suitable for this veneer.